I guess you can't really call it babysitting...they aren't really babies. Celine & Michelle stayed over this weekend and we had a blast. On Friday the girls went to lunch, Michelle (the small one) had her own pizza and Celine and I shared. Then it was home for manicures, pedicures and a make-over session. JJ is sorry he missed that. On Saturday we were awaken at 7 am...seriously did I wake up that early when I was little? What could possibly be fun about waking up that early? But we were up and had breakfast. By the time it was noon I felt like it was 6 pm. I guess that is why their bedtimes are earlier. We really enjoyed our time with them...now we take a nap. This weekend started off with a holiday on Friday...Signing of the Lusaka Agreement a.k.a. Dia da Victoria....peace agreement between Portugal and Mozambique to end the Mozambican War of Independence. School was closed and I was OFF. I mean really off...no checking emails...no going into the office to catch up. I was especially looking forward to this long weekend to get acquainted with my new friend - Mr. Nikon D80. He is a little complex and I needed some time off to figure out what all the buttons are for. On Friday JJ and I started off the day by sleeping in. We woke up and went for "lunch" at the local coffee shop that has real bagels! Who knew I could get so excited over bagels...but Cafe Sol just opened a couple of months ago and it has been such a treat to be able to order a latte and a bagel....yummy! This is the first coffee shop of its kind in Maputo. The rest of the day was spent driving around and lounging at home. On Saturday we went for a walk in the city & market with our friends Dan & Danielle. Then for lunch at a new restaurant on the waterfront - Zambi. Later JJ and I walked over to the Holiday Inn and the beach...the Holiday Inn in Maputo is the best hotel in town. A four star Holiday Inn...not like back home. Saturday night we had dinner at the local Brazilian steak house - ALL you can eat picana! On Sunday we headed out of the city to visit our friend's banana farm. Lance & Maria Laura started this banana farm less than 2 years ago...what an operation! It is amazing to see how it all works from start to finish. Did you know that a banana tree only produces ONE bunch of bananas per year? I didn't. A whole year....needless to say they have a lot of banana trees. They invited a bunch of us (friends from the Latin Group and families) over for a BBQ as well. Maria Laura is from Argentina and a friend of mine through the Latin Group...I love to hear her speak Spanish it sounds so much nicer than my Cuban talk! We had many Spanish conversations going on at the BBQ (Mexico, Miami (Cuba), Argentina & Paraguay). I never thought my Spanish would improve so much by moving to Africa...go figure. You can see the photos I took from our day on the banana farm and pictures of all the kids that were there. There were some very cute children....and TRIPLETS! Yes, my friend Charis from Argentina has 7-month old triplets. I don't know how she does it. Well, our holiday weekend is over now and it is back to work tomorrow. Today is my father's 55th Birthday...please join me in wishing him a very Happy Birthday. 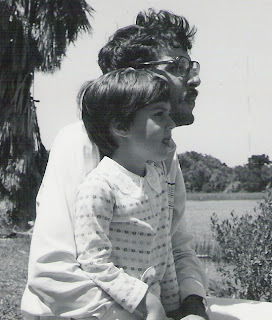 Papi, I miss you so much...please accept this online birthday wish from Mozambique. Hopefully JJ and I will be in Miami soon! Felicidades.